Prime Minister Ralph Gonsalves: How many travel writers will you jail? St. Vincent’s racist Prime Minister is on the record very upset that two BBC journalists ‘snuck’ into the country by telling Immigration authorities they were visiting as tourists when they were really working on a story about Harlequin and Dave Ames. Had the BBC journalists been filming a feel-good travel or investment article, Gonsalves wouldn’t have had a problem with them. Too bad the BBC story was about how Harlequin collected hundreds of millions of pounds from British pensioners but only built a handful of promised holiday homes before running out of money. Gonsalves threatened that Panorama tele-journalists Paul Kenyon and Mathew Hill committed crimes punishable by imprisonment. No word on what PM Gonsalves thinks about Harlequin’s Ponzi scheme, but he is sure upset at the reporters for mentioning it! How dare dem bloody reporters come snooping around and then expose the story of how SVG and its politicians let a twice-bankrupt double glazing salesman get away with using the country to promote a pyramid scheme! One problem though: does Prime Minister Gonsalves intend to apply the same rules to every travel journalist who comes to SVG as a tourist and then writes nice things about the island? Or is Gonsalves only concerned about the law when investigative journalists expose the truth? 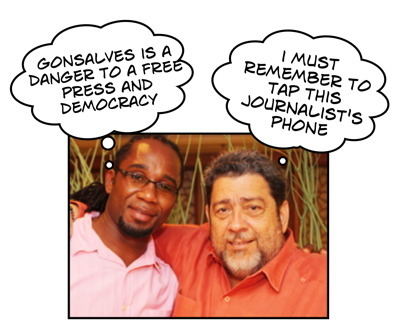 If Prime Minister Gonsalves wants to put some journalists in jail he should start with every travel and finance writer who took a free trip from Harlequin and declared they were on holiday when they arrived in SVG. They are the ones who printed the flowery stories that set the trap for thousands of trusting Britons to lose their pensions. If any journalists deserve jail, it is that bunch. Of course, it’s a good thing that the BBC journalists are of the white race because Prime Minister Ralph Gonsalves is probably going soft on them. You see, Ralph Gonsalves is a racist who dislikes mulattos and brown people – and said so. Cartoon: SVG journalist Kenton X. Chance with PM Gonsalves. See BFP’s More WikiLeaks hit the fan!